My brother Matt was down, so we decided to go fishing at Hope's Nose - an exposed finger of land sticking out to sea in Torquay. I was excited, not just because I love fishing with him, because he's so expert, but also because I've always longed to swim there but have never done so. We'd done a recce the day before, when the sea had been crystal clear on the sheltered side of the point, but overnight there had been rain and gales and so the water had clouded. No matter, it was gloriously sunny and we set to and were soon catching whiting and pollack, as well as a dogfish. There were about 20 chaps fishing - no women at all - and Matthew wasn't too keen on the idea of me going swimming as he viewed it as potentially the latest incident in a lifetime of me embarrassing him. However I was determined to go in and set off to a discreet spot away from the fishermen, taking my 13 year old son along for protection. 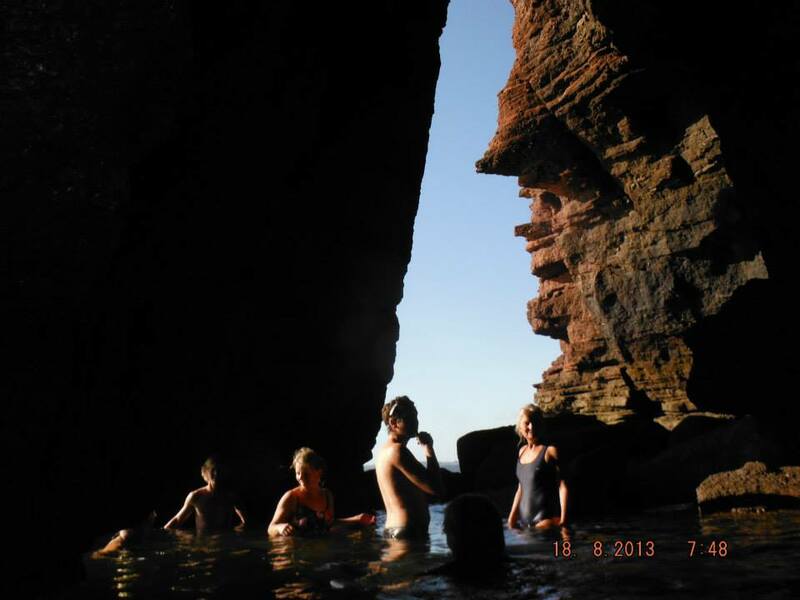 It's a particularly intriguing spot for swimming as there is a spectacular rocky pavement with pink splodges and white streaks, with many inlets and little natural swimming pools which fill up at high tide. I found some convenient natural steps to walk down into the sea, from where I launched off and swam around some of the barnacle-pocked intricacies of the shoreline. Matthew needn't have worried; none of the fishermen took a blind bit of notice, being far more interested in what they were doing than in some strange woman taking a dip. I was on a mission to find a secret pool in the middle of Dartmoor that I'd read about. I set off, OS map in hand, and headed out in what I thought was the right direction. However the path soon petered out and I started to feel rather lonely, without a human soul for miles and only sheep for company. I kept looking at the map and just couldn't work out where the track was that I was supposed to be following. (Later I learnt that I'd made a fatal error right at the start). I could see Bala, Red and Middle Brooks in the distance and so decided to go and explore them instead. After only a minor mishap when I got stuck in a quagmire - quite alarming when you're on your own actually - I found an enchanting pool at Red Brook with crystal clear water and waterfalls; a kind of bower with moss and ferns where piskies might live. I was rather hot by this stage, having clambered over tussocks, sunk into muddy patches and forged various streams, and so stripped off and plunged in, no doubt terrifying any piskies who happened to be around. Afterwards I feasted on mince pies as the stream chattered away. 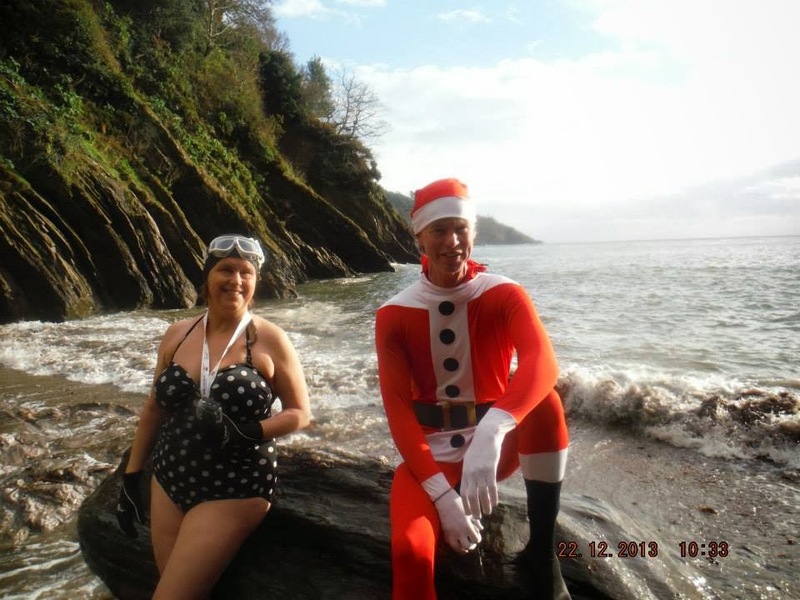 We have been at home in Devon this Christmas so it's been wonderful to swim on both Christmas and Boxing Days. On Christmas Day Yaara, Rachel, Steph, Judy, Angie and I did a sort of "Santa Dash" to the Dart at Spitchwick; we have it down to a fine art now. It goes something like this: put costume on, with robie or dressing gown on top. Put on coat and hat for warmth, and wear neoprene boots on feet. Get in car. 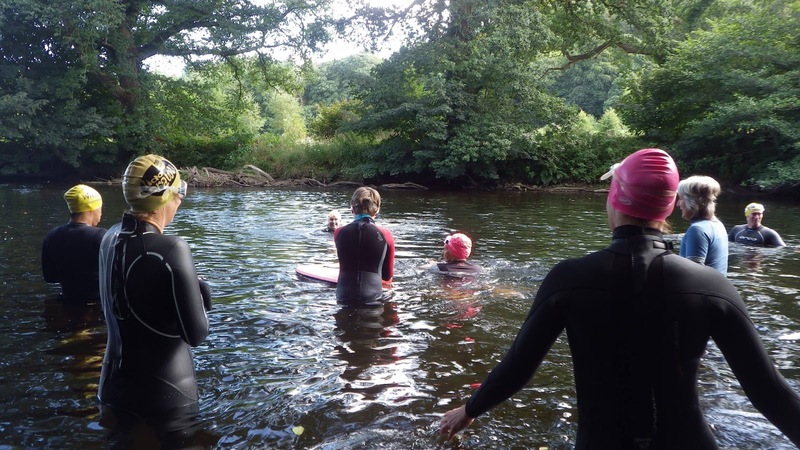 Arrive at river, strip off outer layers, get in river, swim. Get out, fling robie/dressing gown on, put on coat and hat and run back to the car. The perfect way to start Christmas and still be back in time to get the turkey in. 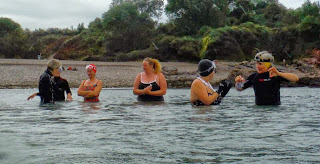 The only slight issue was the rain and hail which decided to fall with a vengeance as we started swimming - but, as Yaara observed, the hail stones were actually very beautiful on the water as it was so cold they didn't melt straight away. Then today, Boxing Day, it was totally different. Blue skies and bright sun, and we went down to Mothecombe to walk to Bugle Hole. I love swimming here - it's a keyhole-shaped inlet which fills up at high tide. Today it was like being in a spin-cycle and totally exhilarating. Nancy kept me company, bouncing around in the water, and I got to try out my new pink and white flowery swimming cap, a present from my lovely sister in law Kate. 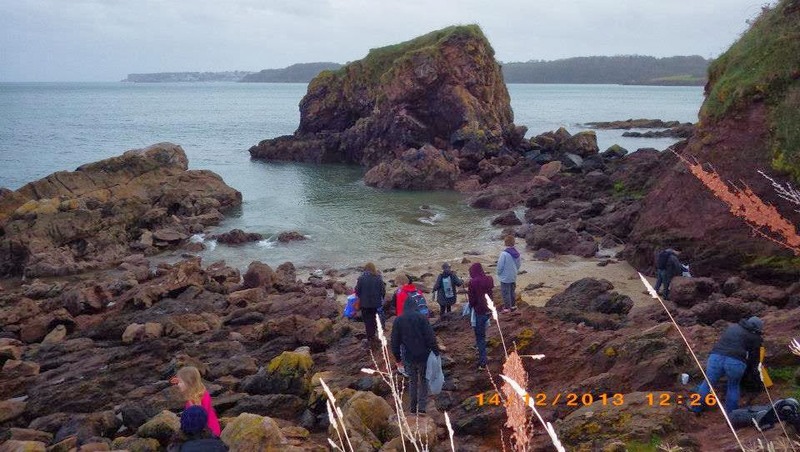 We descended on Sugary Cove in Dartmouth where the tide was high, in anticipation of a swim through what is sometimes grandly referred to as 'the Ravine' - a channel bordered by high rocks on either side, which leads through to Castle Cove. We had Santa with us, aka my friend Allan, who led the expedition through some initially alarming swell and then headed bravely towards the channel. I suppose, being used to going down chimneys and all, he had no fear of this particular tunnel, and was soon half way through the ravine. We followed Santa, like a troop of little elves, and it felt spectacular being surrounded by the high, dark rocks, and getting through to the other side. There were white horses out in the middle of Tor Bay, but down in the little cove sheltered by Armchair Rock, the sea was pretty calm, apart from a gentle swell as we waded in. This place is special, a secluded lagoon with intricate rock formations like coral, with a maze of rocky channels to explore. 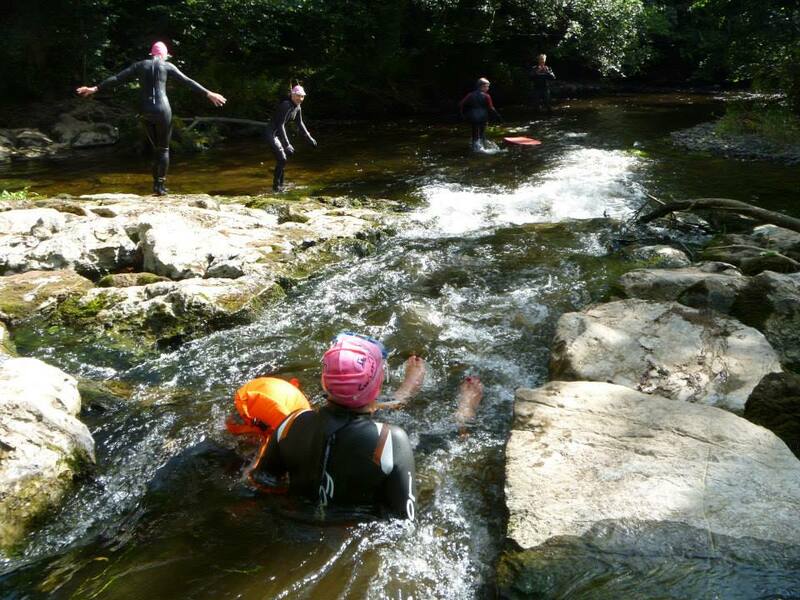 We swam through one, admiring the unnaturally flat wall of rock which bordered us on one side, while trying to avoid injuries as we scrambled over the shallower bits. We came back through into the main lagoon where Karen and Jo jumped off the Armchair; this is a great spot for diving at high water. Thanks to Jo for the top picture. The spontaneous swims are usually the best. This morning a friend posted a picture of the sea in Torquay looking blue, sparkling and flat, and I thought, right, I'm going over. (Fortunately I didn't have anything so tedious as work to be getting on with). Due to the miracles of social media a plan was made with friends within the hour. The conditions were perfect to swim at the sea caves at Livermead - christened the "Hindu Temples" by author Charles Kingsley, who was bowled over by their exotic shapes. As we slipped into the petrol-blue water, bathed in autumnal sunlight, it was hard to believe the worst storm in 20 years had just passed through. Inside the first set of caves the water rumbled like a hungry monster but the shafts of sunlight lightened the atmosphere. In the second set, Gary and Claire found a whirlpool which they sat in, under the 'windows' above - just like being in the Flintstones' house. A totally magical experience, made all the extraordinary by the fact that the caves are just yards from the main road between Torquay and Paignton; you might as well be in Wonderland. 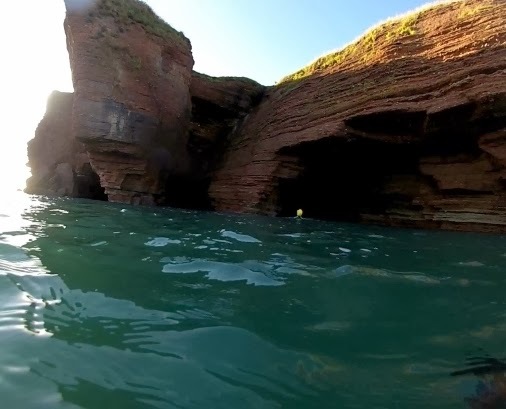 South westerlies have been battering Devon, so I was in search of somewhere sheltered to swim. Elberry Cove, in between Paignton and Brixham, was the obvious choice, tucked as it is in the SW corner of Torbay, with its back to the gales. We arrived to find beautiful calm, verdigris water and as we waded in on a very low tide it felt really quite warm. I've swum here many times and have always been curious about a little cove further along; I assumed it had no name but my son was looking at a map on a board by the beach and discovered it is called Silver Cove. We ended up swimming over to it, seeing herons, black backed gulls and cormorants on the way. I had assumed it would be too cold to swim that far - about half a mile there and back - but the water was lovely. 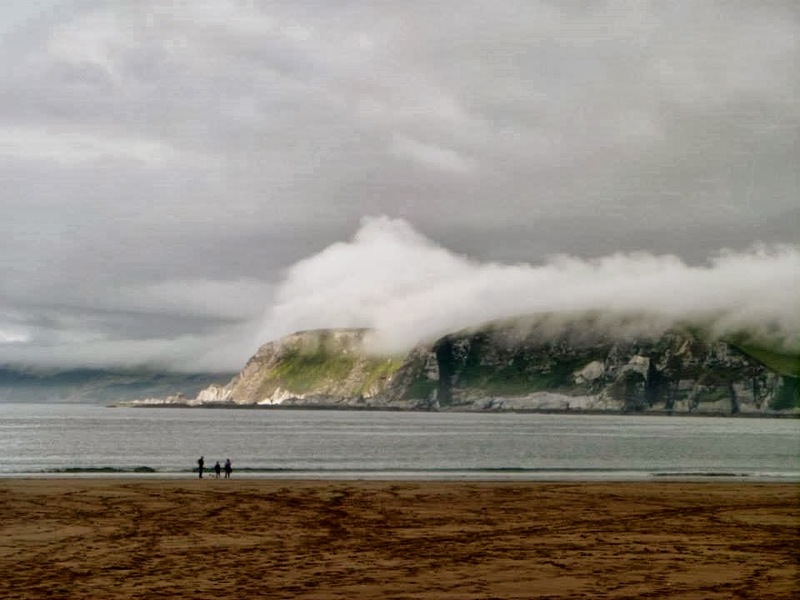 A few of us climbed out to 'claim' the beach; there was no silver or indeed any other treasure in evidence, perhaps it gets its name from the pale stones. Thanks to Jackie Wills for the first picture. We're at that critical time of year when you have to keep immersing to be able to cope with the cold times ahead. 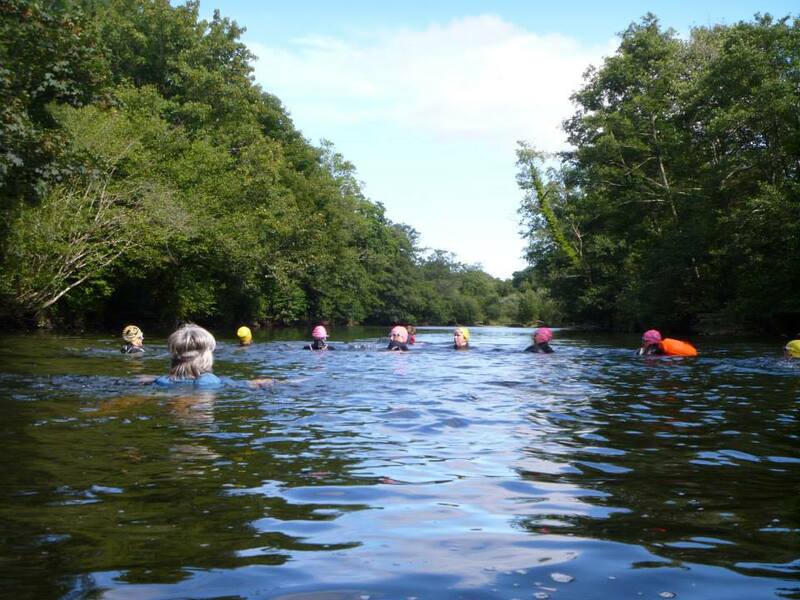 Some friends and I have a regular Sunday morning dip in the Dart which I have only irregularly attended throughout the summer. So this Sunday I was rather dreading getting in. I stood in the water for a while before taking the plunge, while the rest of the party faffed around on the bank. That proved a good thing, as I started to get used to it so when I eventually launched it didn't feel too bad. The water was beautifully clear and there was an amazing underwater autumnal spectacle of leaves drifting down down through the water like little gold coins. 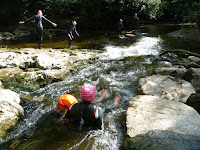 Last time I swam at Watcombe, in Torquay, the sea was flat and crystal clear. 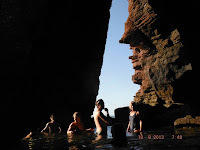 We pootled along the coast under the terracotta cliffs and explored caves and a swim-through where the light created remarkable psychedelic effects. Ever since, I've been wanting to go back, but today's experience could not have been more different. Brown, lumpy seas greeted us, and waves tried to topple us as we made our way in. We swam out of the cove and along the coast, past White Beach and towards the caves, which spewed out white spray busily. No way could we go in. But the bounce and sheer freedom of being out in the elements more than made up for that. It was quite a battle against the constant swell and we all got rather pooped. On our return to the beach we enjoyed various bakery products (as Ellie called them): jam and custard donuts (thank you Jackie) and pecan muffins (thank you Karen) as well as rum and jelly babies provided by yours truly. I've been neglecting my great friend recently. Don't know why really, I was constantly in the river during the heatwave, but in the last month I've just been in the sea. So I was a bit apprehensive about getting back in the Dart again, having heard reports that the temperature has plummetted; indeed it's a little over half the temperature of the sea at the moment. We went along to the Double Jacuzzi Pool, and I was last to get in, sliding in cautiously. But to my great delight the water felt soft and silky - and really quite warm. The big boulders below me looked fuzzy and out of focus. The water has become less clear as the rain brings down mud and debris from higher up the Moor, and the boulders have acquired brown furry coats; no doubt I'll be doing the same in the next few weeks. 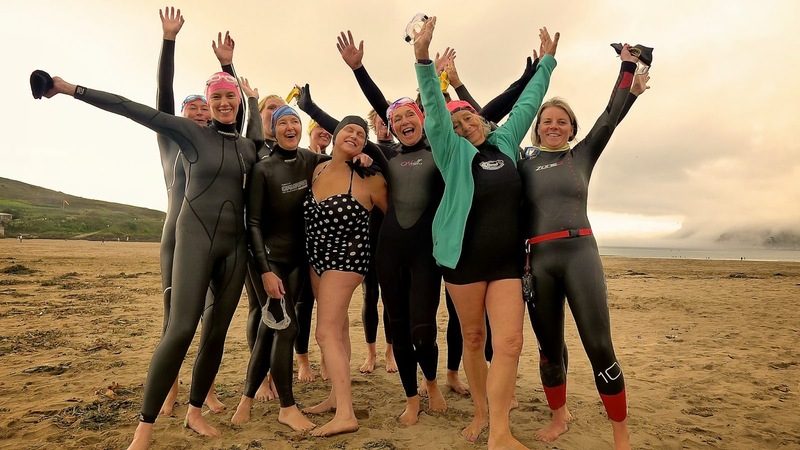 In what's now become a bit of a tradition at this time of year, I had a birthday party at Bigbury on Sea, with BBQ and a swim around Burgh Island. Alex cooked up a storm and we had an absolute feast including sausages, prawns, mackerel, chicken and burgers; it was overcast but warm and we sat on the beach munching and gossiping. 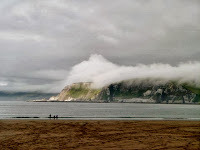 Then we noticed an eerie sea mist lingering over the shiny slate cliffs in the distance; quite beautiful, and then we could see patches of sunlight on the sea in the distance. A group of us set off to swim around the island; the water was flat as a millpond and as soon as I got in I felt excited because it was crystal clear and I could see the ripples in the sand underneath, studded with cockle shells. Kari and I swam in close to the island perimeter, over gardens of kelp and rocks covered in pink lichen; every so often in the gullies we got gently pulled in by small eddies and equally politely spat out. It was a low spring tide: in amongst the rocks were small lagoons, fringed with great swathes of seaweed, hanging down from their roots above us. Back on the beach we had Stephanie's home-made bread and jam for pudding; the sun came out and it felt like summer. Thanks to Allan Mcfadyen and Amanda Bluglass for the pictures. I've just done the most wonderful charity swim. It was a party. Everyone was so friendly, everything was so relaxed, and the whole thing rounded off with live music and a bbq at a pub overlooking the sea. What more could you want? The Pier to Pub Swim in Paignton was organised by three of my friends, Matt, Queenie and Mark. That's not why I'm raving about it (honest). In fact my expectations weren't high at all as I'd been hearing all about their nightmares in the months running up to the event; website registration problems, swimming cap orders not arriving, etc etc. But on the day it all came together, and everyone had a ball. We were off to (new for me) territory: the East Okement river near Okehampton. Lynne led us through ancient woods which bristled with sunlight, and up along the river past a series of pools and cascades. The river ascended like a wonderful watery staircase, and culminated in a spectacular waterfall. We'd just got changed, ready for our dipping extravaganza, when we noticed an old man crawling along the path a bit further down. He seemed rather incongruous, dressed quite smartly in a jacket and carrying a sodden newspaper, with muddy knees. We went to help and it was soon obvious he was very bewildered; to cut a long story short we called the police and some of the party escorted him back; it turned out he'd been reported missing a couple of hours earlier. Good deed done for the day, we started our swimming at the pools above the waterfall, where Allan, Helen and Deb frolicked in a double cascade. 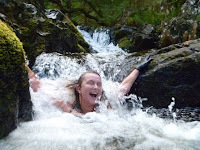 There was a bit of bravado from Lynne as she contemplated sliding down the huge waterfall; sensibly she decided against it and the party scrambled down and swam in the pool below it before climbing up and standing in the falls for some serious head and shoulder massage. Further down the river we found a lovely bowl of a pool, lined with pale grey and green stones; it felt calm and womb-like. From there we swam down through a series of small almost rectangular pools which felt like rooms; some lined with thick green moss to rival the finest flock wallpaper. I am, as fellow blogger Lynne put it, a broken woman. But only in the physical sense, and I'll recover in a day or two. Why? 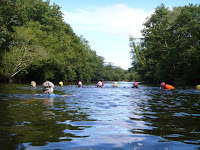 Well I fulfilled a long-held dream to swim a 3 mile bulge of the Dart between Staverton and Totnes, and what's more I did it with a lovely bunch of people. It took us about an hour to get ready by the time we'd all arrived, chatted, sorted out car logistics, and driven back up to the start. We got in at Staverton Mill where the river is smooth, fast flowing and eminently swimmable...but were soon grounded as the river shallowed and then turned into rapids. It was then a combination of slithering, walking and swimming until we reached Still Pool, where there is a rope swing and mini-cliff. More crawling, and then finally it got deeper as we arrived at the waters below Dartington Hall for the final stretch. This I had assumed would be easy, but I hadn't taken into account the majestic wideness of the river. 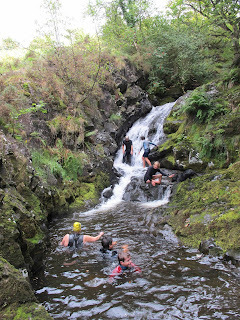 There was hardly any current to carry us, and the water felt almost viscous, treacle-like; sensual but also hard-going, especially after two miles of scrambling/swimming/walking. 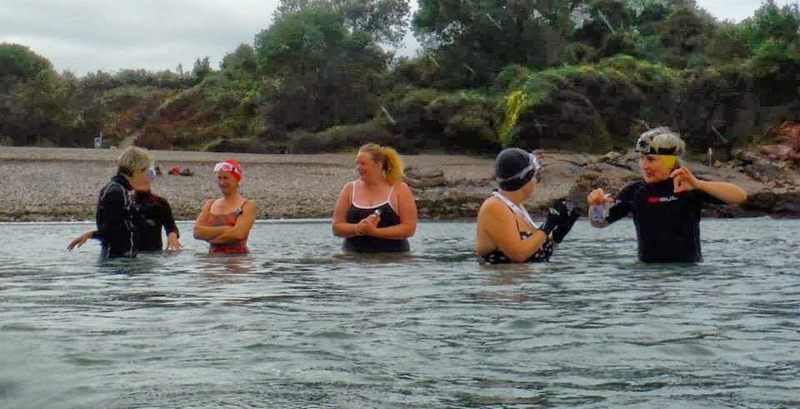 Lynne and I were swimming together at the back of the group and were pretty exhausted by now; we got slower and slower, and eventually dragged ourselves out up the bank like prehistoric mudfish, before walking on wobbly legs back to the cars. But what a swim! A journey through a tunnel of green, with a constant dappling of light like a kaleidoscope as we moved over a gorgeous mosaic of stones, some almost jade in colour. The water fizzed with gold-streaked minnows. But the highlight was the gnome garden high on a bank above the railway line. There must have been at least fifty of the wizened little creatures watching us swim by. Thanks to Allan Macfadyen and Stephanie Simon for the pictures. Sometimes you just have to have faith that a plan will work. Back in the real world, that was proving a little difficult when I opened the front door at 05:15 to a depressing Dartmoor drizzle. It had all seemed such a magical idea: a swim at sunrise in Torquay. 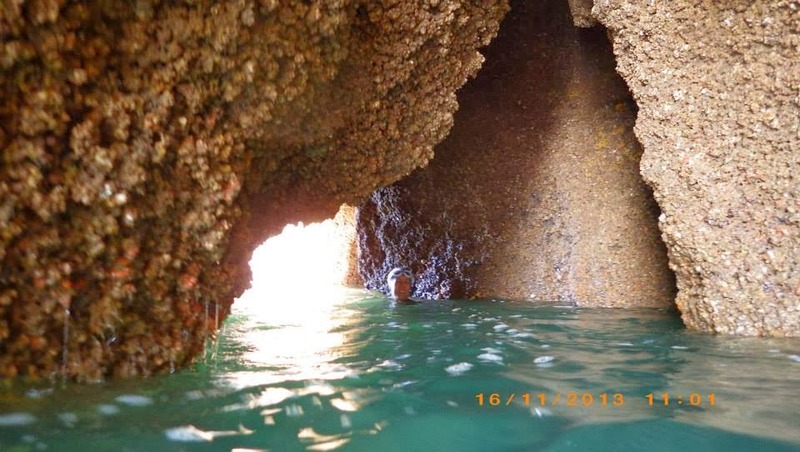 We would drift through a set of sea caves, dubbed the "Hindu Temples" by "Water Babies" author Charles Kingsley, as the sun's rays lit up their mysterious interiors. We tried not to feel disheartened as we set off through the damp darkness, but then the mood changed as the ever optimistic English cry of "it's brightening up over there" rang through the car. On arrival, there was the faintest pink tinge on the horizon in the east, and as we got changed it got more and more intense. Into the water, and the colours were changing all the time; as the sky turned from pink to burnt orange and back. Inside the caves, the water was petrol blue against the terracotta sandstone. We swam on, over reefs festooned with weed, watching fish dart in and out, and shoals of sand eels swirling around. 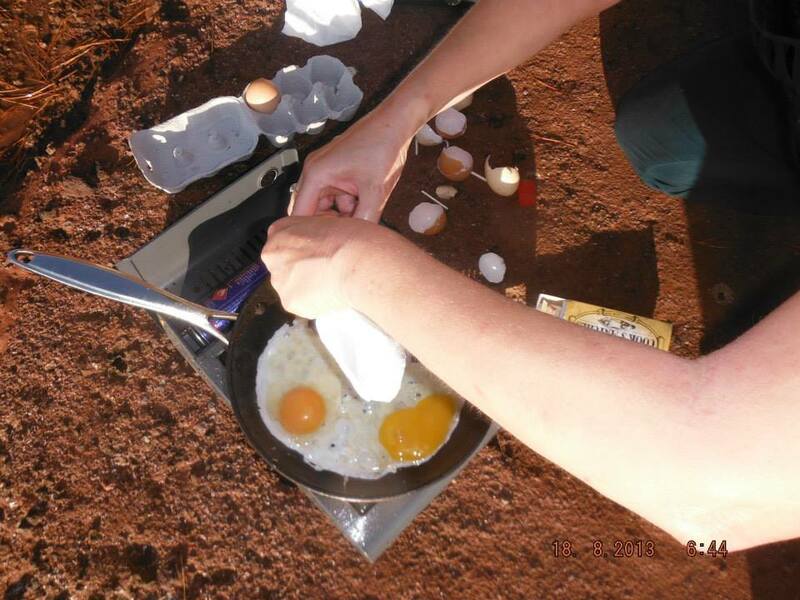 Then it was out for a fry-up on the handily-placed flat rocks overlooking the sea. Matt and I recently took out a charming Frenchman, Olivier Vergnault, on a wild swim. He works for the local paper, and we were hoping to get some coverage for our book. We'd decided to take him to London Bridge, a dramatic rock arch in Torquay. It's a short, easy swim that never fails to make an impression, especially as you approach the arch; it looms above you spectacularly. However as he unwrapped his box-fresh new wetsuit, I started to wonder if we were mad taking him out; the calm clear seas were turning dark and choppy. What is usually a short, easy swim, turned out to be anything but, as not only was the wind against us, but to add injury to insult, there were jellyfish too. Olivier confessed afterwards that he'd found the experience quite, ahem, challenging, but despite this he has asked to come out with us again! Read his hilarious report here. I had a day with my goddaughter today; particularly precious as I am the only female in my household. 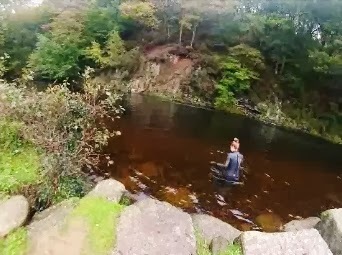 She's 10, and a brave and adventurous swimmer. We went to Maidencombe, a lovely little cove at the northern end of Torquay. The cafe there is selling my book; we dropped off more copies before heading on down to the beach where we had two glorious swims in exceptionally clear water. We swam along the left hand side of the beach, winding in and out of the rocks and gullies; we saw dark silhouettes of wrasse against the sand, like shadow puppets, and numerous shoals of glittering sand eels. There are several great lumps of rock in the water which have fallen off the cliffs above; the water around them is blue and deep and we had fun climbing up the thickly barnacled ledges before hurling ourselves off the other side into the depths below. Then it was back up the steps to the cafe for bacon rolls, before back down to the beach for more swimming. A perfect summer's day. The anticipation was building; all year we'd looked forward to it. The "Official Round the Island Race" at Burgh Island. And this year there was going to be a special section for 'most glamorous competitor". Kari, Rachel and I had been planning our outfits for weeks. Kari was to wear a specially designed 'rockpool' cap, I would be in my vintage costume, complete with fringing and pearls, and Rachel would be attired in a black and silver spandex dress with shoulder pads. Woof! You can imagine our disappointment when we got a phone call in the morning saying the swim was cancelled because it was just too rough around the island. Well, we thought, we shall go anyway, we can still pose and parade. Which we did, draping one male companion, John, with grey beads, and ourselves around the gates of the hotel. (Our other male companion, Miguel, declined both peals and lipstick). We then set off through the swell and waves to the Mermaid Pool, where the water was calm, warm and green....we swam to our hearts' content in there while the stormy seas raged around us.